I participated in a campaign on behalf of Mom Central Consulting for L’il Critters. I received product sample to facilitate my review and promotional item as a thank you for participating. My toddler is strange when it comes to eating. He may like something one day but then the next day says he doesn’t like it. It is hard to make sure he gets all the vital nutrients that he should get. We try to make sure he samples everything on his plate but some days that is easier said than done. 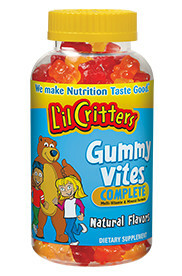 So, to help make sure he is getting all the vitamins he should, we give him L’il Critters Gummy Vitamins. We have no issues with my son taking his vitamins with L’il Critters. I give him one in the morning with his breakfast and I feel better knowing that he is getting the nutrients he needs. When I give my son his gummy vitamin, he puts a big grin on his face and squishes the bear. Who can resist squishing a gummy? Then he eats it up with a “Yum, Yum. That tastes good.” All while he is nodding his head and chewing. You can currently go to the L’il Critters website and print a $1 coupon! What is your favorite thing about L’il Critters? Does your child like them gummy vitamins? They sound great! And if he likes the taste of them, that’s even BETTER!